Description: Antwerp, Henricus Aertssens 1st first edition 1641 Copperplate engraved pictorial titlepage + 4 nearly full page scenes in the life of Chisius by E. Quell ../P. de Jode. . Small octavo laced through vellum later manuscript spine titling (tips worn/bit darkening to vellum/lacks ties) Half title present +Engraved titlepage +pp of dedication +5-135pp +ppp approbations +colophon. Bookplate of Bib. Maj. 111 Mount Street (Jesuits). First few pages with marginal damp mark not affecting text, repaired marginal hole to one leaf without loss of text, some edge dusting to top margin but paper crisp and without signs of use. The margins are wide and the side notes give dates and references. *Written by an unnamed Augustinian from Cologne according to Bibliotheca Sanctorum, III, column 1235. 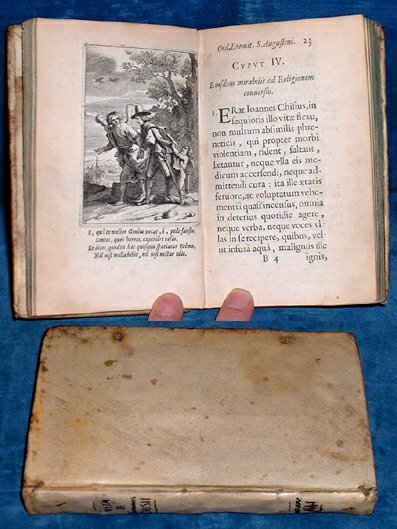 The engraved titlepage is unusual showing cerubs with atributes of Hercules and Mercury and helmet & owl of Athena with cardinal's hat and coat of arms above. Nicely illustrated biography of the life of Chisius.